If A24 can be said to have a house style for its horror films, then THE HOLE IN THE GROUND (a current Sundance Film Festival Midnight attraction that the company releases March 1, preceded by a DirecTV premiere this Thursday) fits squarely into it. A mother-centric mood piece tinged with folklore, it’s very much in the various traditions of HEREDITARY, THE WITCH and THE BLACKCOAT’S DAUGHTER, though in terms of subject matter, its closet current cinematic cousin is Orion’s THE PRODIGY, out next week. For all its familiarity, director/co-writer Lee Cronin treats his material with an adult, somber point of view that holds the attention and pays off in some genuinely tingly moments. Having first won attention with his short GHOST TRAIN, which was concerned with haunting echoes of the past, Cronin makes his feature debut with a story that’s very much here-and-now. Set in his native Ireland, THE HOLE IN THE GROUND stars Seána Kerslake as Sarah O’Neill, a young mother who has spirited her preteen son Chris (James Quinn Markey) away from their abusive husband/father and taken him to live in a middle-of-the-woods fixer-upper so remote it doesn’t have an address. In the midst of the trees beyond the house lies a feature the realtor no doubt didn’t mention: a gigantic sinkhole that appears to be incrementally, barely perceptibly growing. Needless to say, Sarah doesn’t want Chris going out and exploring the area on his own, but soon after they’ve settled in, he disappears one night. When Sarah gets him back, he is—at first subtly, and then more demonstrably—not himself anymore. 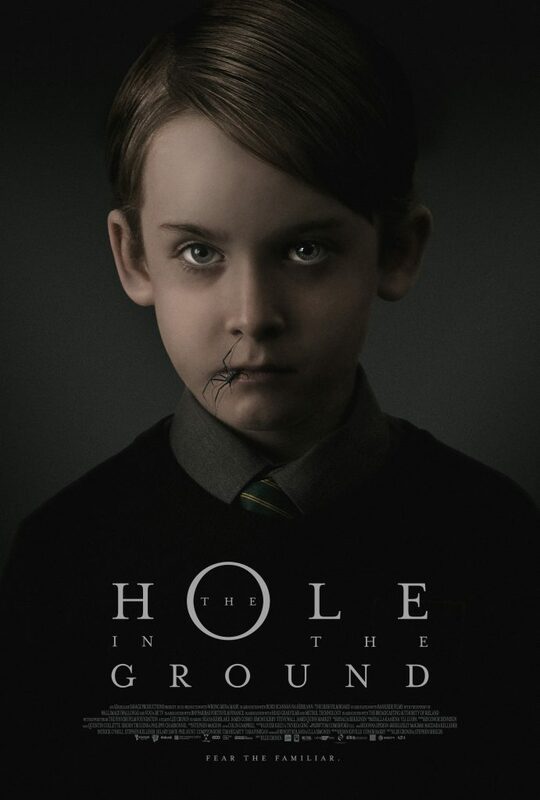 Like THE PRODIGY, THE HOLE IN THE GROUND plays on an age-old parental fear: As one character asks, “Do you ever look at your kids and not recognize them?” No doubt every mom and dad has had that thought watching their son or daughter grow out of childhood innocence, but Chris is a special case. Though still well-behaved by most appearances, he starts acting out and doing odd things while only Sarah is watching, sometimes without his knowledge. In particular, there’s one moment, very effectively staged by Cronin as a static shot outside an open door, that makes it clear Chris has come back from his nocturnal walk in a terribly altered state. Markey, the latest in a long line of preternaturally talented kids discovered by this genre, is very good at suggesting something diabolical under Chris’ calm surface, and at letting the bad side out in believable ways. Kerslake is also quite effective as Sarah slides from motherly devotion to her son to disbelieving fear of what he has become to still-frightened determination to reverse whatever has happened to him. Veteran Irish actor James Cosmo (GAME OF THRONES) has a few nice scenes as Des, a neighbor who knows local secrets that may help Sarah out, particularly as they pertain to his addled wife Noreen (Kati Outinen). While the atmosphere and specific visual tricks Cronin employs aren’t especially groundbreaking for this kind of tale, he deploys them at a steady, evenhanded pace that draws you into Sarah’s plight. Tom Comerford’s moody cinematography does a lot to keep you on edge, though Stephen McKeon’s heavy, portentous music tries a little too hard; more effective is the sound design by Quentin Collette, Jeroen Truijens and Philippe Charbonnel, which is full of odd and unsettling sonic details. As for the title “character,” Cronin shows just enough of the hole itself to maintain an aura of mystery and unease about it, right up to the genuinely scary climax when Sarah goes to confront it. Thanks for the reviews of the film The Hole in the Ground, his review is extremely long, thorough, so it is very helpful to me. Success for you Michael.